HullBreach Online Lite for the Nintendo DS is now available as well! Just point to http://hullbreachonline.com in the browser, and it will do the rest! Join the other 137683 members by taking part in the galaxy of HullBreach Online! Since the game is and always will be free to play, there is no reason to say no to that. Check back to this website periodically for updates. I will use this blog to both explain in-place game elements and to reveal newly added abilities and features. Currently the HullBreach Online accounts are integrated with tWiiter, DS Opera SDK, and Wii Opera SDK, so that one login allows all the great and upcoming software to be seemlessly used. SOAP Web Services are now in place for developers of websites who wish to join a unified Wii Internet Channel homebrew community. These Web Services will continue to expand. For more information, check out the Homebrew Blog. Since HullBreach accounts and Twiiter accounts are shared, why not share the content as well? Done. Now anyone playing HB Online Lite will instantly receive new Twiiter posts right inside the chat pane! This makes staying up-to-date with friends while on-the-go even easier. 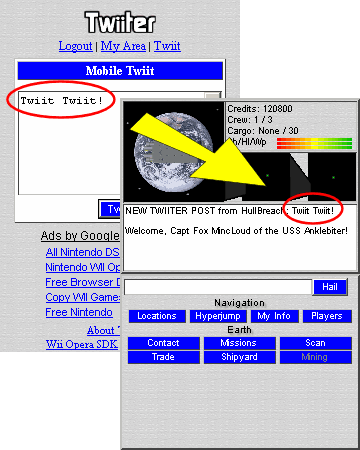 Twiits show in a similar way to hails or system-wide messages: They scroll through the chat feed and display who made the posts with the alert "NEW TWIITER POST" at the beginning. 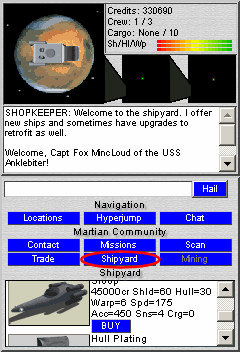 Shipyards are where players go to purchase a replacement ship or to retrofit an upgrade onto a current ship. Many locations offer shipyards, but due to politics of each region, the ships allowed for sale may greatly differ. 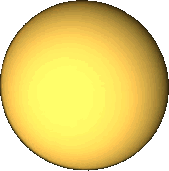 Similarly, upgrades can greatly vary based on the atmosphere in a region of space, even within the same sector. Several classes of ships exist, and the abilities of those ships can be critical to many missions. Ships with high speed and acceleration with long warp ranges can run distances quickly before a timed mission has expired. Ships with large amounts of cargo space allow trading and smuggling for profit. Those with scan or cloaking strengths can conduct reconaissance missions with ease. Be aware that purchasing a new ship automatically jettisons all cargo and forfeits all current missions, so be sure to get the job done before upgrading.